Although both RestoringThePride.com and Dashmesh Pictures operate on Sikhism's key concept of seva (selfless service to humanity), the cost of web hosting, data bandwidth, and video production is not cheap. In order to keep pro-Sikh related efforts operational, any type of financial assistance is always greatly appreciated. 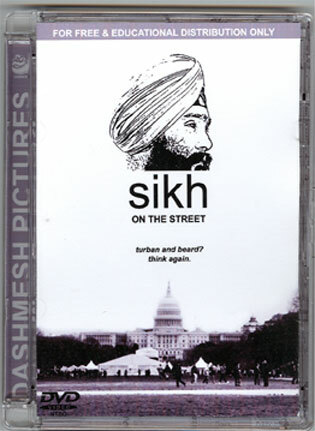 Now that you have seen the award winning Sikh on the Street, get this professional quality DVD package with a minimum donation of $20 USD. This complete DVD package is ideal for school or professional presentations, distribution to those seeking a quick reference material towards Sikhism, or as a collector's item in your personal DVD collection. Online Donations are collected through the Paypal service using a secure, and safe, connection. DVD production and packaging is done at cost, and the DVD format is NTSC. With a minimum donation of $15 USD, you'll receive a complimentary DVD containing all completed works of Dashmesh Pictures. Please be sure to contact us after you mail in your donation. Films made by Dashmesh Pictures may contain copyrighted material, which has not always been specifically authorized by the copyright owner. The sole purpose of Dashmesh Pictures is promoting education and awareness of Sikhism. We believe this constitutes a "fair use" of any such copyrighted material as provided for in Section 107 of the U.S. Copyright Law. In accordance with Title 17 U.S.C. Section 107, the material featured in any Dashmesh Pictures work is distributed without profit, which includes for research and educational purposes. For more information, see the description of limitations on Exclusive Rights: Fair Use. If you wish to use copyrighted material featured in Dashmesh Pictures works for purposes of your own that go beyond "Fair Use," you must obtain permission from the Copyright Owner.